The nervous and exciting first day on a new job. I haven't done this in over a decade. I also get to find out if I'll still be conglomerating with any sort of regularity. With that in mind I decided to go with a full suit, hoping that overdoing it on the first day would make it easier to continue. Kind of asking forgiveness rather than permission. The necktie is a brand new Talbott Best of Class. Yes, I actually bought it brand new with the first day on the new job in mind. I now understand why they are considered some of the best on the planet. I have other Best of Class ties but they have already been knotted by someone else before I acquired them. Now that I've experienced a brand new one, I'll go back to acquiring others on Ebay. I had to try it once. The background is black with an open basket weave design. The colors of the weave are shades of purple, blue, and teal(?). It's a real eye catcher and it will be a favorite for a long time to come. The dress shirt is also a Robert Talbott. It's got a windowpane weave with a dobby weave inside each "pane". I know it's called dobby because that's what the description said. I purchased both from Hansen's Clothing in Iowa. I dealt with Mr. Hansen himself and it was a pleasure. The shirt and tie cost more than the suit. That's probably the last time that will happen and it won't be because I'll buying more expensive suits. The suit is the charcoal gray one. I had planned on having a new, medium gray solid but it's not yet ready. Such is life. Hopefully I'll be able to continue conglomerating or I'm going to have to get rid of a bunch of dress shirts and ties and acquire some other form of clothing. I do have other clothing but not in a quantity sufficient for everyday wear. That is one sharp tie! 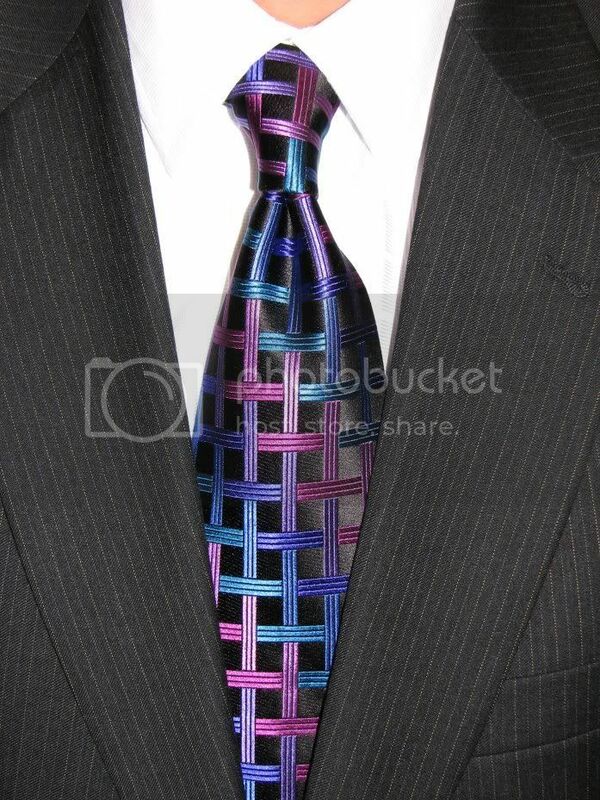 Try it with a navy blue pinstripe suit!